The morning of Hailey's birthday I posted a letter to her on the blog. If you want to read it you can go HERE to do so. 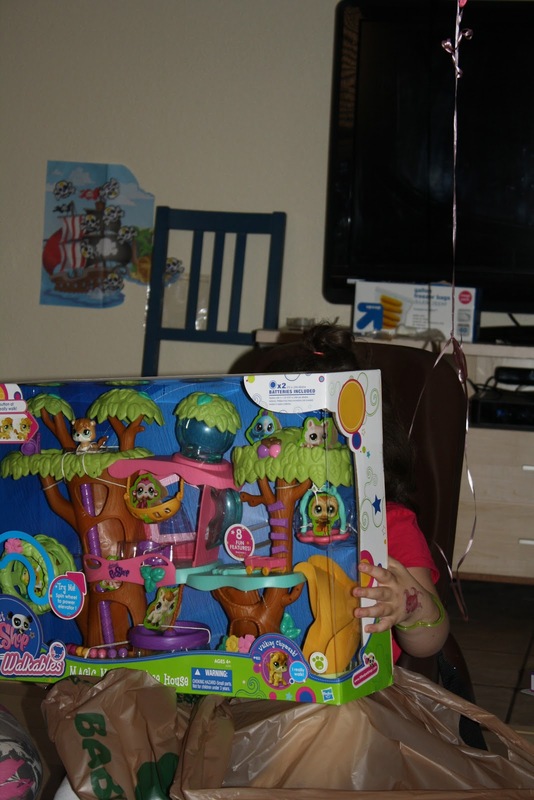 I was so happy to be celebrating Hailey's 5th birthday that I tried to make it as fun and memorable as possible. 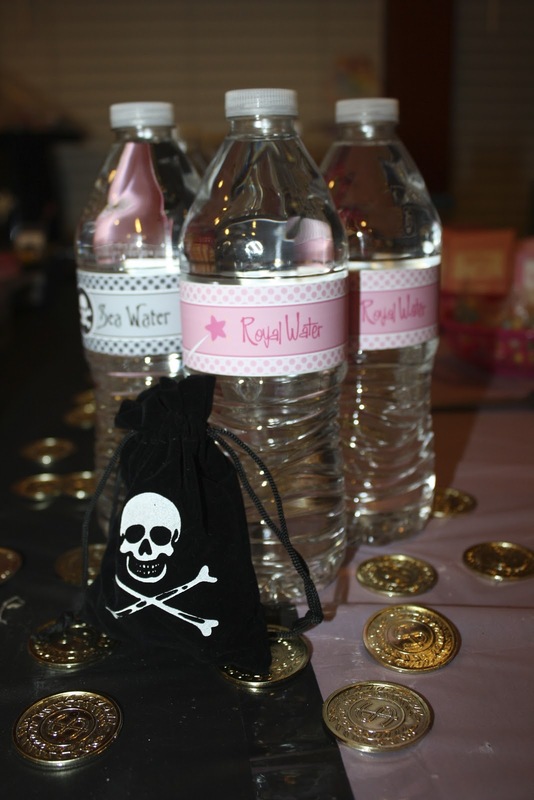 The theme this year will be Princess and Pirates!! I always get made fun of when it comes to THEMES. Josh always says that the theme of a birthday party is BIRTHDAY PARTY and it doesn't need a theme, I say it does. I don't know how many birthdays I will get to throw. I say go all out if you can! This one was a fun one to pull off too. It's amazing what a little colored paper can do! Here are some pictures of the set up I had going on. 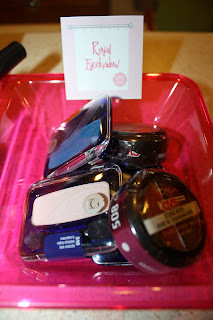 There were lots of Pink and Black, Rhinestones and Skulls! 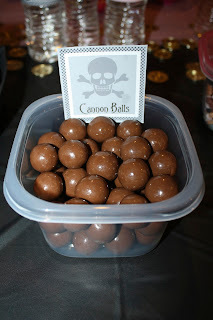 Cannon Balls aka: Malt Balls! YUM!! These were my favorite and I had to make sure to buy these as close to party time as possible so that there were some left for the party! LOL! Pirate bars and Pirate Nuggets! Pirate and Princess Treasure Box. Hailey loves a good lollipop! Princess Bars aka: Hershey Bars! Gold Bars and Sticks of Dynamite (Kit Kats)!! Pirate ROCKS!! These chocolates REALLY looked like little Rocks! So Adorable! We had Sea Water and Royal Water for the Kiddos! You can't have a Pirate Party without Gold Coins made of Chocolate! I had "Royal Slippers" for the Princesses and I had Eye Patches and mustaches for the boys! 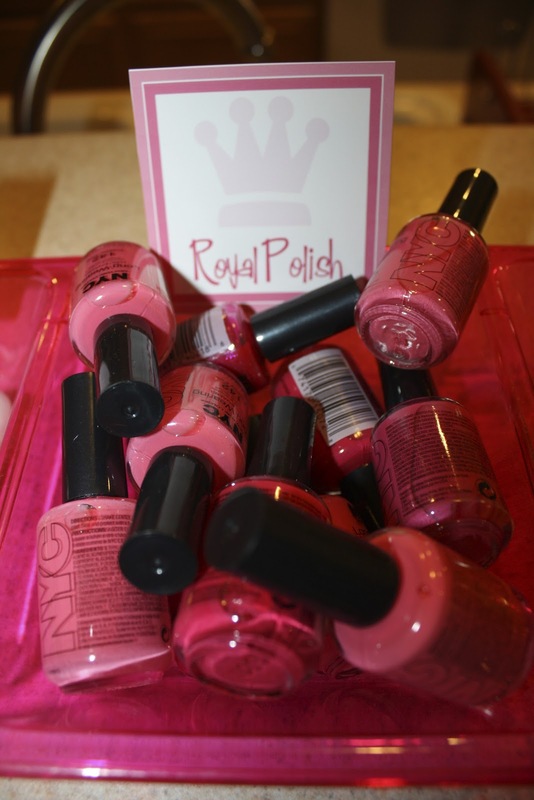 Princesses were treated to Royal toes and nails at the Princess bar. Royal Eyeshadow for each princess. I'm a fan of the blue!! 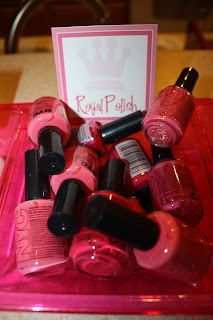 This was a picture of the Royal Princess Make up and Nail table. You must have a crown if you are a Princess!! Pirate Jewels for the boys! I loved being able to pull this together! SO much fun! I have said before how much Hailey LOVES make up! What's a party without a cake? Even though Hailey uses a feeding tube I knew she would think it was odd if we didn't sing to her. The awesome Owner of Happy Thoughts Bakery here in Las Vegas was so great to come up with the cutest Princess and Pirate cake! The cake was SO YUMMY! She also makes the BEST Maple Bacon Cupcakes EVER!!! Keep Happy Thoughts Bakery in mind for your next event. Thank you Megan!! 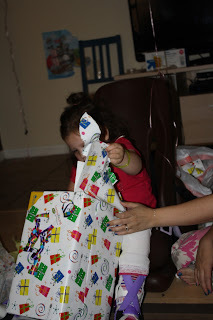 Everyone was so thoughtful to get Hailey things that I call "working toys" This was velcro food that Hailey can exercise pulling apart and if she regains more gross and fine motor skills she can practice "cutting" the food with a play knife. She loves playing with this during her PT time. Opening gifts are a lot more fun now! Hope you had a great birthday Hailey!!! We love you! !